Assume you have a Galera Cluster currently managed by ClusterControl. 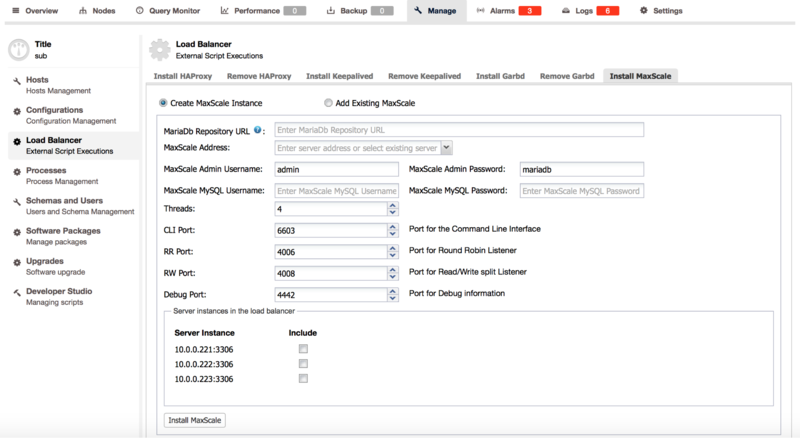 As next step you want to install MaxScale as load balancer. 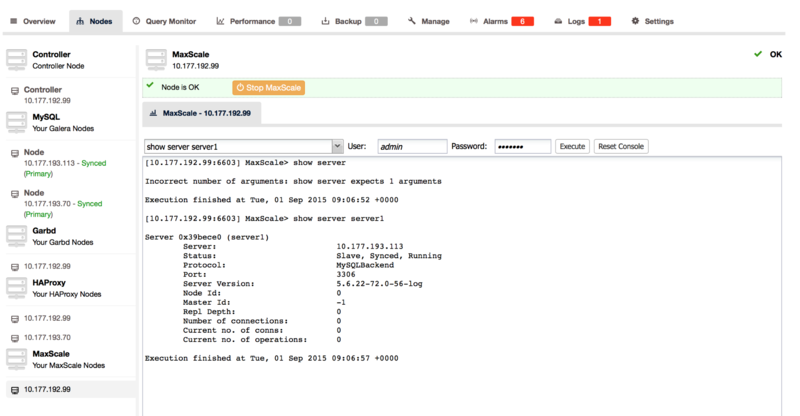 From the ClusterControl UI, go to Manage > Load Balancer > Install MaxScale. You’ll be presented with following dialog box. 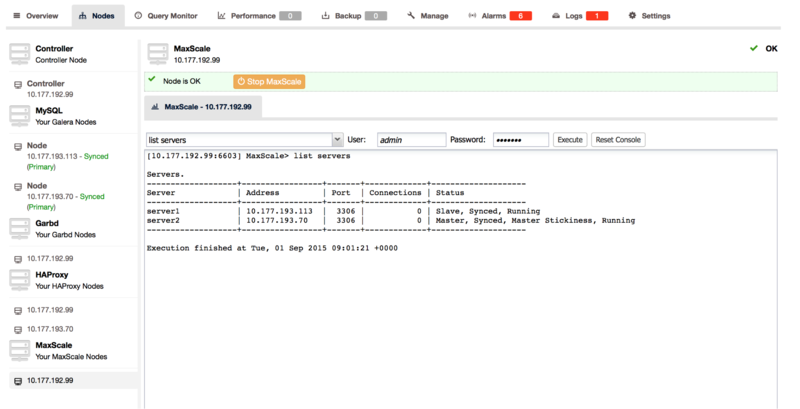 choose or type in the IP address of the node where MaxScale will be installed. ClusterControl has to be able to ssh in a passwordless fashion to this host. 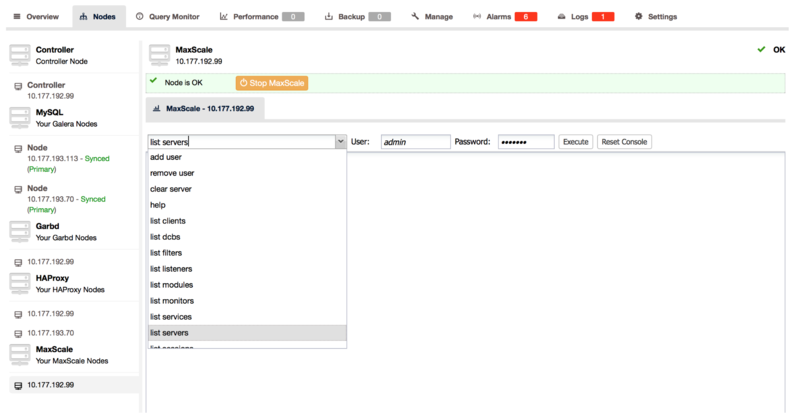 username and password - it will be used to access MaxScale’s administration interface. next is another username/password - this time, it is a MariaDB/MySQL user that will be used by MaxScale to access and monitor the MariaDB/MySQL nodes in your infrastructure. which ports should be used for different services. 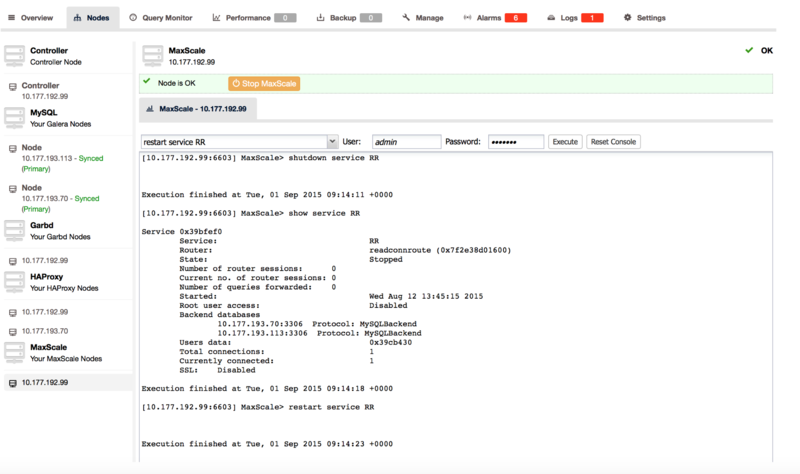 Currently, MaxScale deployed by ClusterControl comes with a CLI service and Debug service - those are standard services available for MaxScale. 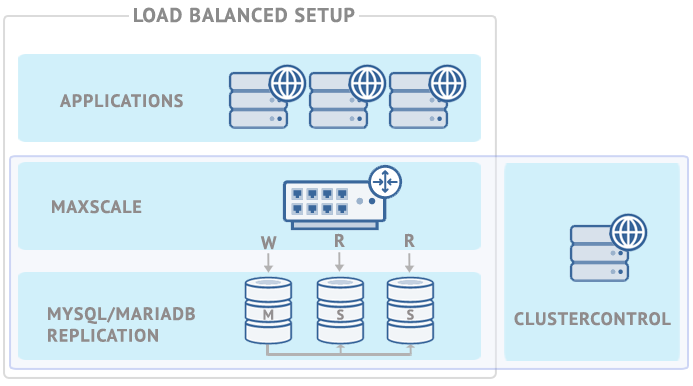 We also create two ‘production’ services - ‘RW’, which implements a read-write split and ‘RR’ which implements round-robin access to all of the nodes in the cluster. Each of those services have a port assigned to it - you can change it at the deploy stage. 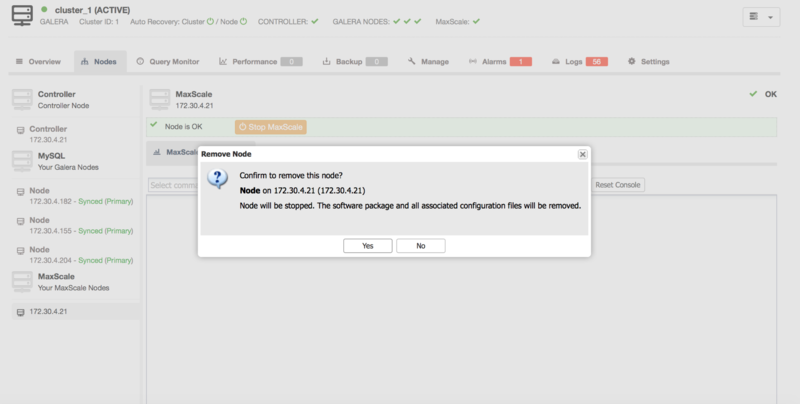 At the bottom of the dialog box, you’ll see your nodes with checkboxes - you can pick those that will be included in the proxy’s configuration. 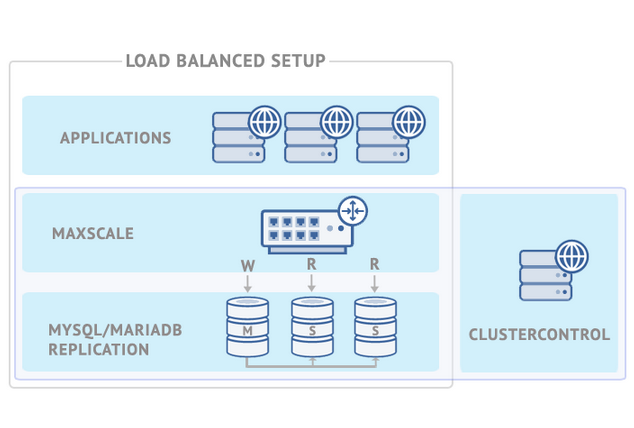 MariaDB introduced individual links to the repository where MaxScale is stored. 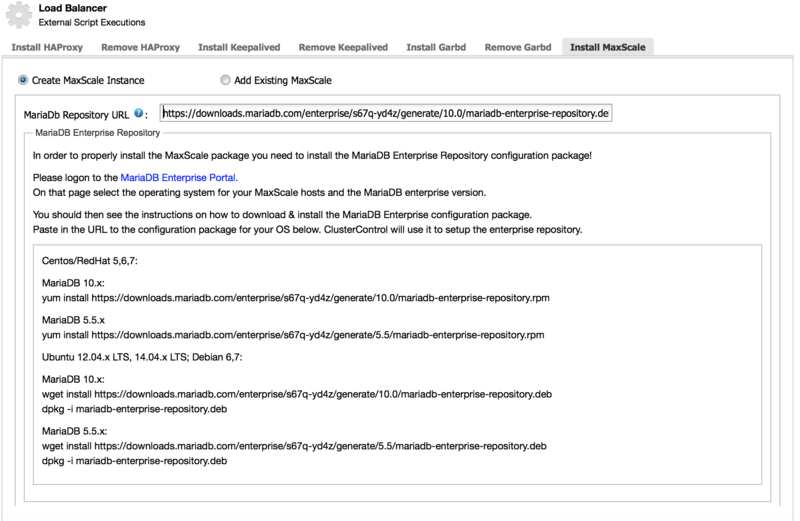 To get your link, you should log into the MariaDB Enterprise Portal and generate one for yourself. Once you have it, you can paste it in the MariaDB Repository URL box. This concludes the preparations for deployment, you can now click on the ‘Install MaxScale’ button and wait for the process to complete. You can monitor the progress in ClusterControl > Logs > Jobs. When it finishes, it prints some examples covering how you can connect to your MaxScale instance. For better security you should delete this job by clicking the ‘Delete’ button above it. How to add an existing MaxScale instance to ClusterControl? 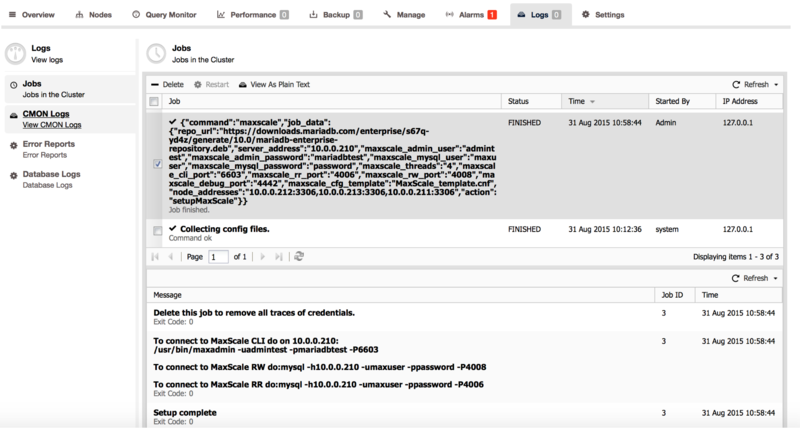 If you already have MaxScale installed in your setup, you can easily add it to ClusterControl to benefit from health monitoring and access to MaxAdmin - MaxScale’s CLI from the same interface you use to manage the database nodes. The only data you need to pass here is IP of the MaxScale server and port for the MaxScale CLI. After clicking ‘Install MaxScale’, it will be added to the list of processes monitored by ClusterControl. How to uninstall MaxScale from ClusterControl? If, for some reason, you would like to uninstall MaxScale, go to the ‘Nodes’ tab and then click on the ‘-’ icon next to the MaxScale node. You’ll be asked if you want to remove the node. If you click yes, MaxScale will be uninstalled from the node you’ve just chosen. 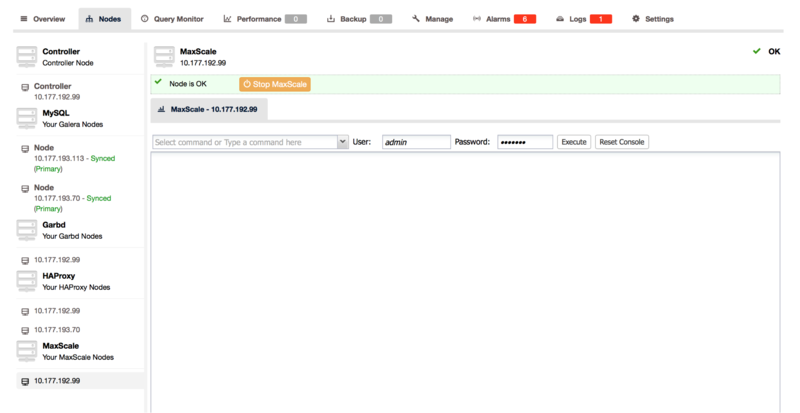 How to access MaxScale MaxAdmin commands? You can see the status of the node, and stop the instance if needed. In the user/password boxes, you need to enter MaxScale’s administrative user credentials - this is what you put in the Admin username/password fields where installing MaxScale. If you added an existing MaxScale installation, please use here any administrative user that you created. By default (if you do not provide any input) ClusterControl will try to use the default username and password created during the MaxScale installation (admin/mariadb). The drop down box contains a predefined set of commands that you can execute by just picking them from the list and then clicking on the ‘Execute’ button. For a full list of commands, you can execute the ‘help’ command. You can clear it at any time by using ‘Reset Console’ button. CLI access from ClusterControl talks directly to the MaxAdmin, therefore you can use ClusterControl to execute everything that you are able to run using the MaxAdmin CLI client.